The past two weekends and the week between have been really hectic, so did not find time to pen down anything. The weekend of Oct 6th we had been for a “Fall Tour” to the Upper Peninsula of Michigan(more on this in next post). The week between Oct 7th and Oct 14th was strangely busy (considering the fact that I am “Vetti” most of the time at work). This weekend was also satisfactorily busy – Saturday was spent at a friend’s house and yesterday we had a couple over at our place ( this was nice because 1) we like the couple a lot and they are good fun to be with 2) I got a chance to experiment on my culinary skills). So, Friday night Reliance India earned a lot of revenue, when I was on phone with amma trying to get some recipes for “quick” sweets that I could make. I wanted to move away from the “comfort zone” that the easy-to-make MTR Gulab Jamun pack gave. So, I decided to make this very simple-yet-very-tasty sweet that amma would concoct at the shortest notice – this 7-cup cake. 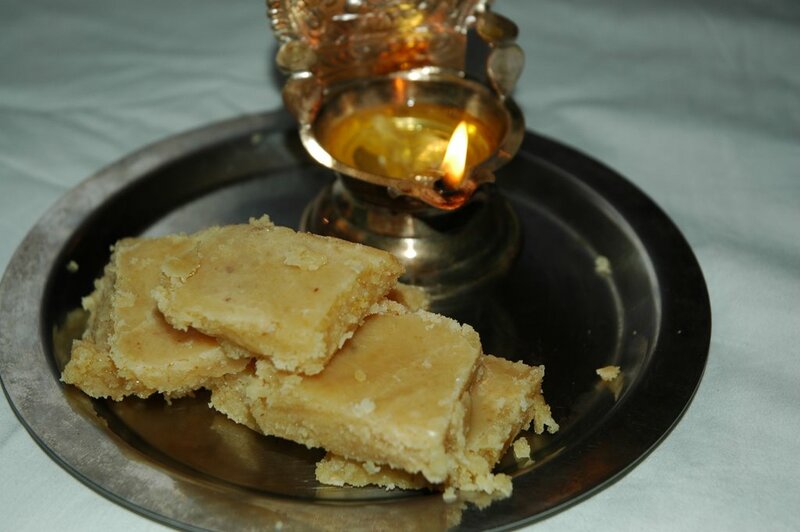 I would like to submit this recipe for the “Jhiva for Diwali sweets” held here. Mix all the ingredients, except ghee in a kadai. Pour ¼ of the ghee into this mixture. Mix all the ingredients well and cook on medium flame. Keep stirring intermittently for 30 mins or so later (the time is based on the electric coil heater that we have in the apartments in the US). Now the mixture will start frothing and start to come off from the sides of the kadai. Slowly pour the rest of the ghee into the kadai, while stirring continuously. Within few minutes, the entire mixture will harden a bit and become thick. Take it off the stove and pour it onto a flat greased plate/vessel and let it cool for about 15-20 minutes. While it is still hot, draw the lines with a sharp life to make small diamonds/squares. After it is cool, you can take out the pieces and store them in an air-tight container. that sounds like the besan laddus that we make without the coconut, of course. But, it is my staunch belief that things can only be better with the addition of coconut. Thank You for participating and I will see you at round up. hey kewl.. i was looking for the recipe for this 7 cups since long.. my friend used to give me a diff propotion (1:1:2:3).. which of course i dont remember. $$ Vee - being a southie I think I like coconut in almost anything :) ... Thanks for adding me in the round up. $$ Gomesh - Am glad my recipe proved useful to you... Do tell me how it was. hey vidhya.. 7 cups sweet is my favourite. Amma used to make it often for me and my father as only we both eat sweets in our family :D). Visiting from Vee's roundup link. Thanks for participating in Jihva with this gorgeous, mouthwatering entry. 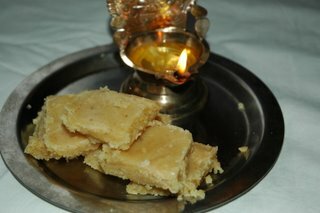 I like this burfi. My mother also prepares the same sweet with coconut and senaga pindi combination. I love, love it! Wishing you and family a Happy and Shubha Deepavali! $$ Indira - Thanks for visiting my blog. It feels such an honour having you here. I visit your site - mahanandi almost everyday and am a great fan of your cooking. I try almost all your recipes .... Oh! Thanks a ton for your wishes. Hope you and your family also have a great and bright year ahead! Visiting from the JFI round up. I like your style of writing .Think Iam gonna frequent your site here after. Hi Vidhya, I am new to your blog. I wanted to know this recipe and googled for it, though I didnt expect to see any Indian recipe for "7 cup cake!" Tried it & found it irrestible! Here I go off to gobble up 1 more piece! It is rather interesting for me to read that article. Thank you for it. I like such topics and anything connected to them. I definitely want to read more soon. It is extremely interesting for me to read that post. Thanks for it. I like such topics and everything that is connected to this matter. I would like to read a bit more soon.